High Profile Estate. Solid Land Title. Modern Infrastructure. Amen Estate Lekki Lagos Nigeria: I am pleased to introduce to you Amen estate phase 2 Lagos. Amen estate phase 2 is a premium serviced estate with land and houses for sale in Lagos Nigeria. The estate is located along Eleko Beach Road, which is directly off the Lekki Epe expressway. Land for sale in Amen estate phase 2 is covered by a certificate of occupancy from the Lagos state government. So, when you buy land or houses for sale inside Amen estate phase 2, you're buying a secure investment. You're welcome to invest in Amen estate phase 2 Lagos whether you currently live in Lagos, other parts of Nigeria or even outside the country. Why invest in Amen estate phase 2? Simple. 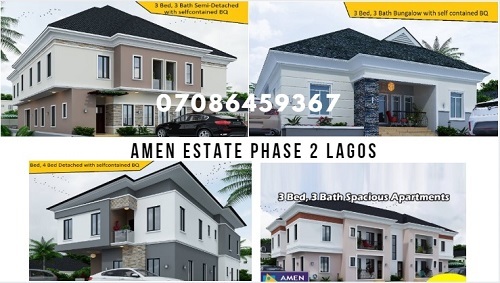 It makes financial sense to invest in Amen estate phase 2. What is the price of a plot of land in Amen estate phase 2 Lagos? A 600sqm plot of land in Amen estate phase 2 is 15 million Naira. The land title is certificate of occupancy (c of o). You can choose to buy a plot (or several plots) of land in Amen estate phase 2 Ibeju Lekki Lagos or you can choose to buy one of the apartments, semi-detached houses or detached houses for sale in the estate. Prices of apartments and houses for sale in Amen estate phase 2 is from 20 million Naira to 85 million Naira. Click HERE to chat with our CEO, Samson Itoje, on WhatsApp and get all your questions answered. P.S: If you're visiting this page using a desktop computer or laptop, clicking the second link above will take you to Facebook. Log into your Facebook account, scroll to the bottom of the page and click GET STARTED.